Die Cast Machinery, LLC Buys, Sells, Appraises and Supplies six axis industrial robots used in Die Casting and Foundry applications. 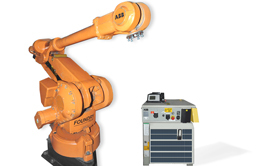 Major brands include ABB, Fanuc Robotics, Reis Automation, Kawasaki and Kuka Robotics. Receive email alerts when new inventory matching Robots become available? Recently Sold Listings in the Robots category.